The death occurred at the Queen Elizabeth Hospital on Wednesday, December 30, 2009 of Mr. John R. “Johnny Boy” Dunn of 11 Dorchester Street, Charlottetown in his 70th year. Beloved husband of the late Shirley (Flynn) Dunn, and dear father of Mike (Doris) and Sherri (Larry) Runighan. He is also lovingly remembered by his grandchildren Michael Jr., Keshia, Natasha and Taylor, sisters Barbara Imough, Janie (Ted) Kitson, brothers Clarence (Sarah) Dunn, Joe (Elaine) Dunn, Gordie Dunn, and numerous nieces and nephews. He was predeceased by his parents Clarence “Chow” and Helen Dunn, father and mother-in-law, Joe and Kate Flynn, sisters Florence Dunn, Joan Dunn, Edna Ryan, Beatrice “Beatty” Morton, Dorothy Dunn, Frances Sudsbury, Janet Dunn, and brothers Lloyd “Poggy” Dunn, Robert “Bobby” Dunn and Jackie Dunn. Resting at the Hennessey Funeral Home until 9:45 on Monday morning then transferred to the Church of the Most Holy Redeemer for funeral mass at 10:00 a.m. Interment will take place later in the Roman Catholic Cemetery, Charlottetown. Visiting hours will be held on Sunday 2:00 to 4:00 and 7:00 to 9:00 p.m.
Members of the Holy Redeemer Knight's of Columbus will hold a prayer service at the funeral home on Sunday evening at 6:30 p.m.
Royal Canadian Legion Branch #1 Charlottetown will conduct a Member's Tribute Service at the Hennessey Funeral Home, 35 Longworth Ave, Charlottetown, at 6:45PM on Sunday 3 Jan 2010. If so desired memorial contributions may be made to the Canadian Cancer Society or the Oncology Unit of the Queen Elizabeth Hospital. The death occurred peacefully at the Queen Elizabeth Hospital on Wednesday December 24, 2008 of Joseph E. Dunning of Bunbury, in his 82nd year. Veteran of the Second World War. Beloved husband of Helen [Magennis-Doyle] Dunning. Cherished father of Linda Thomas, Wayne J. [Wilma] Dunning, Gary S. [Marita] Dunning. Joe is also fondly remembered by his step children, Velma [Craig] Higginbotham, Barry [Cathy] Doyle, Kevin [Barb] Doyle, Trevor [Cathy] Doyle; grandchildren Nicholas [Maegan Jones] and Tristan Thomas and Andrew Dunning; step grandchildren Travis and Kelli Higginbotham, Aron, Kendra, Jennifer, Tyler, Randi, Kent, Jamie and Madison Doyle, great grandchild Kaeden Thomas and step great grandchild Colby Doyle; his sister Grace MacLeod and sisters-in-law Violet Dunning, June Dunning. He was predeceased by brothers and sisters Otto, Francis, Ernie, Dan, Velda, Jim and Betty Walsh. Resting at the Cutcliffe Funeral Home from where the funeral service will be held in the funeral home chapel on Saturday afternoon at 1 p.m. Interment to take place later in the family plot at Floral Hills Memorial Gardens, Pleasant Valley. If so desired memorials in Joe's memory may be made to the PEI Heart and Stroke Foundation. Visiting hours at the Funeral Home on Friday evening 7 to 9 p.m.
Royal Canadian Legion Branch #1 Charlottetown will conduct a Veteran's Tribute Service at the Funeral Home at 6:45PM on Friday 26 December 2008. Peacefully at Whisperwood Villa on Sunday, January 9, 2011 of Ralph G. Dumont of Charlottetown, age 89 years. Beloved husband of Margaret (Martin). Dear father of Daphne and Rick (Linda). Granddad to Rob and Jenni Dumont. Brother of Dorothy Roop and brother-in-law of Don (Arlene) Martin and Elizabeth (Martin) Bushell. Cousin of Richard (Gemma) Piper and Pamela. Survived by several nieces and nephews in Canada and United States. Predeceased by his parents Emile Albert and Blanche (Toombs) Dumont, and brothers Lincoln and Richard. Son-in-law of the late Al and Ken Martin. Resting at MacLean Funeral Home Swan Chapel. Funeral Thursday from The Kirk of St. James at 11 a.m. Interment in Sherwood Cemetery. Family flowers only, however, if so desired memorials to Pat and The Elephant or Anderson House would be appreciated. Visiting hours Wednesday from 3 to 6 p.m.
Royal Canadian Legion Branch #1 Charlottetown will conduct a Veteran's Tribute Service at the MacLean Funeral Home at 5:45PM on Wednesday 12 January 2011. At the Halifax Infirmary, Halifax, NS on Tuesday, September 10, 2013 of Lawrence “Junior” Durant of Charlottetown, age 89 Yrs. Loving father of Penny Durant and Jack Durant (Glenda). Junior is also survived by 11 grandchildren; 14 great grandchildren; sisters - Olive Bryanton (Albert), Eleanor Durant and June Durant; and brothers - Clair Durant (Judy) and Reg Durant. He was predeceased by parents - Lawrence and Millie Durant, daughter - Janice Kelly, sisters - Florence Durant and Christine MacLeod (John - deceased) and brothers - Donald and Clifford Durant. Resting at Hillsboro Funeral Home, 2 Hollis Ave., Stratford for visitation on Thursday, September 12, 6-9 P.M. Funeral service will be held at Stratford Chapel, Hillsboro Funeral Home on Friday, September 13, at 10:00 A.M. Interment will follow at St. Bonaventure’s Cemetery, Tracadie. The Royal Canadian Legion, Charlottetown Branch No. 1 will hold a service of remembrance at the funeral home on Thursday evening, at 5:45 P.M.
Raymond Joseph Durant, 90 years, passed away peacefully on Monday, January 7, 2013. Ray had been battling Alzheimer's disease since 2000. Predeceased by his wife, Helene (nee Tremblay); brothers, Ezra, Herman, Willard; and sister, Jeanette. Beloved father of Mike (Charlottetown) and Nancy (New Haven), and loving grandfather of Alexandra and Ryan. Ray was born in Summerside, P.E.I., in 1922. He was a veteran of the Second World War, member of the P.E.I. Regiment and notably the First Special Service Force. Ray worked briefly in Ottawa after the war, then sailed for several years on the ice-breaking ship "Tupper" with the Canadian Coast Guard. He married Helene in 1960 and returned to P.E.I. to raise a family working for several years as a bartender, and eventually moving to the Department of Highways where he drove the fuel truck in the summer and a "salt shaker" in the winter. Ray had a magnetic personality. He drew people to him with his sense of humour and his huge heart. He loved music and dancing with his lovely wife Helene. In later years, Ray and Helene travelled regularly to attend dances in Moncton and in Ottawa and also took vacations to Mexico with daughter Nancy and her (then) husband Doug. In May 2005, Ray was honoured to head the VIP procession of the parade that opened the new War Museum in Ottawa. He was overwhelmed by the thousands of people who turned out to honour the veterans and the many who ran along side his jeep to shake his hand and thank him for preserving their freedom. Ray told his daughter later that the day "was one of the high points in his life". Ray was a great listener and had many friends whose lives were touched by his kindness and compassion. He was a wonderful father and husband and a hard working man. He loved trout fishing and the outdoors; in his own words: "there is not a stream on P.E.I. that I haven't fished in". He enjoyed carpentry work, painting and landscaping work and was very proud of the wonderful home he built and maintained for his family. Ray's last few years were spent at the Atlantic Baptist Home where he received the best of care and was dearly loved by many of the staff. Ray's wishes were to have a private memorial ceremony with his children. In lieu of flowers, donations to the P.E.I. Alzheimer's Society or the P.E.I. Atlantic Baptist Home in Ray's memory would be deeply appreciated. "Thank you Dad for all you did for us and for giving us the most precious gift of all - our cherished memories of you. Love Mike and Nancy"
Arrangements entrusted to MacLean Funeral Home Swan Chapel. Online condolences may be made at www.macleanfh.com. Peacefully at the Queen Elizabeth Hospital on Monday, March 21, 2011 of Mr. Joseph J. “Joe the Barber” Dykens (Veteran of WW11) of Charlottetown age 93 years. Beloved husband of the late Helen “Pete” (nee Peters) Dykens and dear father of Chrystine Gallant and Lona Ryan (Kevin). He is also survived by grandchildren Randy Holmes (Karen Burke), Mark Holmes, Dawn Holmes (Scott Gaudet), Jill Holmes, Terry Dykens (Wendy), Shannon Piccott (Chris), Kelly Dykens, Christine MacCallum, Deron Lund, Bethany MacCallum (Jeff); great grandchildren Alex Holmes, Abbigale Holmes, Craig Stoddart, Connor Holmes, Kenzie Gaudet, Josh, Kennedy and Kaden Holmes, Zack, Calvin, and Eric Dykens, Max and Maggie Piccott, Joey and Clifford Doucette; great great granddaughter, Hailey LeBlanc. He was predeceased by his parents Daniel and Elizabeth (nee Aulcroft) Dykens; grandson, David Gallant; son, Larry Dykens; daughter-in-law, Maida Dykens and daughter, Maida MacCallum. Resting at the Cutcliffe Funeral Home where the funeral service will be held in the funeral home chapel on Saturday, March 26, 2011 morning at 11 a.m. Interment later in the family plot in the People’s Cemetery, Charlottetown. Branch No. 1 of the Royal Canadian Legion will hold a veteran's tribute service at the funeral home on Friday evening at 6:45. In lieu of flowers, memorial contributions may be made to the P.E.I. Cancer Treatment Centre. Royal Canadian Legion Branch #1 Charlottetown will conduct a Veteran's Tribute Service at the Cutcliffe Funeral Home at 6:45PM on Friday 25 March 2011. At the Queen Elizabeth Hospital on Saturday, September 13, 2008 of Harold Theodore Ellis, Charlottetown, Veteran of World War II, age 91 years. Beloved husband of Eva (nee Shaw). Dear father of Beverley and Grant. Lovingly remembered by his extended family Adele (Shaw) and Harold Moore, Laurie Anne and Trent Good, Ty, Tristen, Kinley, and numerous nieces and nephews. Brother of Margaret. Brother-in-law of Leah and Isabel Ellis, Victor Shaw Shirley), Janet and Dorothy Shaw and Dorothy Bryanton (Harry). Predeceased by his daughter Freda Margaret, by his parents Theodore and Mary Jane (Munn) Ellis, by his brothers Cecil, William (Phyllis), Eric, Alden (Margaret), Olin and Rupert. Resting at Belvedere Funeral Home for visitation Monday 1:30 - 3:30 and 6:30 - 8:30. Funeral from the Charlottetown Bible Chapel, Lincolnwood Drive, on Tuesday at 10:30 a.m. Interment in People’s Cemetery, Charlottetown. Memorial donations may be made to Emmanuel Bible Camp or Pat and The Elephant. Please refrain from wearing scents. No lilies, please. Royal Canadian Legion Branch #1 Charlottetown will conduct a Veteran's Tribute Service at the funeral home at 6:15PM on Monday 15 September 2008. The death occurred peacefully at the Queen Elizabeth Hospital on Monday, June 4, 2012, while surrounded by the love of his family, of Russell Maurice Ewing of Charlottetown, aged 87 years. Russell was born in Shelbourne, Nova Scotia, on June 27, 1924 the son of Rev. Merton and Lulu (Shipley) Ewing and stepson of Winnifred (Hunter, Estabrooks) Ewing. Russell is survived by his wife of 56 years, Eileen (Burke); his son Jim (Marie), Stratford; sister Isabel (John) Hildebrand, Fredericton, N.B. ; granddaughter Sarah, Charlottetown; sister-in-law Thelma (Burke) Farrell, Vancouver, B.C. ; and seven nephews and nieces. Russell was a veteran of the Second World War and a psychologist by profession, working in both the P.E.I. Departments of Health and Education. We would like to extend a very special thanks to the doctors and staff of the Queen Elizabeth Hospital emergency ward and Cancer Treatment Centre for giving him an extra two years of quality living, as well as units 1 and 3 for their caring and support in the final weeks. Resting at the MacLean Funeral Home Swan Chapel. Funeral Friday from Spring Park United Church at 10 a.m. Interment in the People's Cemetery. Visiting hours Thursday from 4-7 p.m.
Family flowers only, however, if so desired, memorials to the Queen Elizabeth Hospital Foundation would be appreciated. Peacefully, surrounded by love, at the Provincial Palliative Care Unit on Friday, August 22, 2014, of John J. Farquharson of Bunbury, age 89 years. 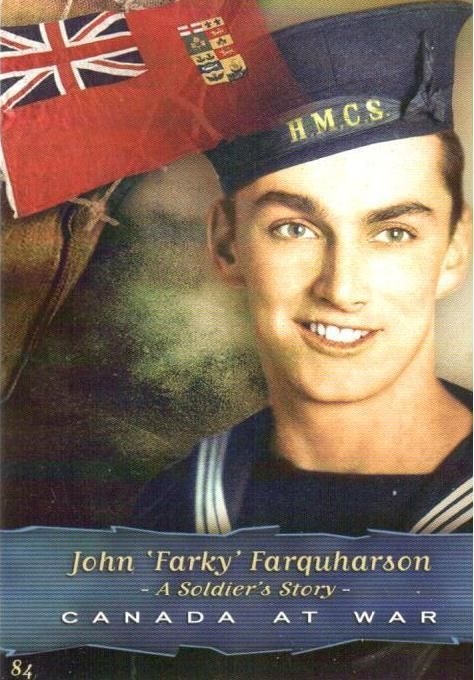 Beloved husband of the late Jennie (MacLaren) Farquharson. Loving father of Jane (Doug Crossman), Paul (Jennifer MacInnis) and Robert (Jill LeBlanc). Grampy to Sami, Mark, Laura, Kate and Laura, and great-grampy to Henry, James, Noah and Lauren. Predeceased by his parents, Adele and Russell and sister, Helen Farquharson. Resting at MacLean Funeral Home Swan Chapel. Funeral Tuesday from Clifton United Church at 9 a.m. Interment in the church cemetery. Family flowers only, however, if so desired, memorials to ALS Society, Clifton United Church or the Salvation Army would be appreciated. Visiting hours Monday from 2 to 5 p.m. The Royal Canadian Legion will hold a service of remembrance at the graveside on Tuesday following the service.